I used to use coupons like they were going out of style, but I found that I was actually spending more money to “save” rather than actually saving money. I got so obsessed with using coupons that I was buying things I didn’t need or larger quantities of items I do use but they would go bad before I could use them all up. These things actually cost me more money rather than saving me money like I had intended when I started couponing in the first place. Honestly, I think my obsessive couponing phase was born out of watching the TLC show “Extreme Couponers”. If you’ve ever watched that show, the people on it are really extreme. They walk out of the grocery store with four shopping carts piled up with goods they’ll never be able to use before they expire, and yet they only had to pay about five percent(or less) of the original retail cost. When coupons are used properly in a non-extreme way, they can still be a great way to save on groceries and other household products. But there are a few unwritten etiquette rules you should keep in mind when you are couponing. One of the most annoying things about wannabe couponers is their selfish desire to clear off entire shelves of products. It might look cool when the people on TV sweep their arm across the shelf effectively putting all of the products from that shelf into their shopping cart with one fell swoop, but in real life it’s simply rude and annoying. I hate going to the grocery store only to find out that they are completely out of the sale products that week, especially when I go on the first day of the sale before many shoppers have even been to the store either. Usually they are out of stock due to an “extreme couponer” having been there right before me. 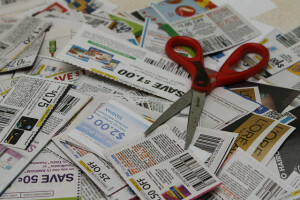 You can commonly find coupons placed with products around the grocery store, including “peelies” that are attached to product packaging, or “blinkies” which are usually spit out by a blinking machine attached to the shelf of the corresponding product. These coupons are there for your use, but they are not there to be abused. If you really feel that you need to steal the coupons off of and buy 30 packages of Oreos be my guest. I guess I didn’t really need them anyway. But it is even more irritating when couponers do this with products I do actually need, like household cleaners or personal care products, like deodorant. Couponers take longer to shop than most everyone else because they have to be extremely organized and detailed to get the best deals. I understand that and I can respect that. But these couponers should keep in mind when peak shopping times are, like right after 5 p.m. on any given weekday, and right after church on Sundays. During peak times the grocery store is busy and it’s not very fun to be stuck behind one of these extreme couponers in one aisle after another as they make their way through the store. If you plan to use a lot of coupons and take your time shopping, please consider shopping during non-peak times. One last thing. At the checkout please be kind to the cashiers as they ring up your items, check over your coupons, and apply your discounts. Your orders can be really complex and they are doing the best they can to do everything correctly. Sometimes computers mess up and ring an item in at the wrong price. When this happens, don’t hesitate to point it out but please do so kindly. You should also try to avoid doing multiple transactions or large transactions during peak shopping times, again this is highly annoying to the after-work and after-church crowds who usually just want to pick up an item or two before heading home to make lunch or dinner. Whenever I see coupons in magazines, I cut it out and put it in an envelop with its own label. I remember when I was in a salon, I tore some pages off just to get some coupons! haha! By the way, when there is a need to use it, I as much as possible adjust my needs so that I can use my coupons productively. Good ideas Jayson! Hopefully the salon didn’t mind you using their magazines to get coupons, haha. I am actually not much of a coupon person, so I have never thought about how you can be a jerk with them as well. I do get a little irritated though when I am behind someone checking out and the coupon process takes longer than actually ringing them up. In those moments, I usually just take a deep breath and applaud the person for their frugality. I try to stay calm about it, but it can be very frustrating sometimes! Ugh! That would be annoying. We usually stock up on good sales/coupons. One that we love is the frozen fruit. Blueberries, raspberries and strawberries are the best. We use these for smoothies and it’s an awesome way to get your fruit in the morning. We try not to clear the shelf and buy more than we need. But we always use it so the more we can fit into our freezer the more we buy. I use frozen fruit in my green smoothies for breakfast too. I do stock up when there’s a sale or I have good coupons, but I don’t clear the shelves. I love watching that show! I always get inspired to use coupons but I know I won’t be able to reach their level of “extremeness”. I hate having big stocks of products and see them expire later on.. I do stock up too, but like you I try not to get too carried away otherwise spoilage ruins any “savings” you may have had. One that doesn’t get talked about much is not using coupons on a first date. It’s OK to use them on future dates, but if you try to use it on the first date it will look like you chose the place just because you had a coupon. You might even come off looking cheap too.